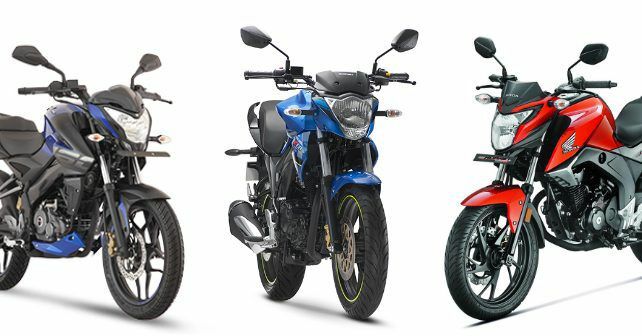 Bajaj has tasted great success with the Pulsar brand - first with the traditional Pulsars (which continue to bring good numbers even today), and more recently with their newer range - the NS, AS and RS. But despite having such a wide variety of Pulsars on offer, they have surprisingly been absent from the premium 150-160cc segment. That vacuum has now been filled with the launch of the new NS160. Bajaj has developed an all-new engine for the Pulsar NS160. It produces 15.3bhp and 14.6Nm from a 160.3cc oil-cooled single-cylinder motor. Of the bikes in this comparison, the Bajaj Pulsar NS160 is the only one that comes fitted with a four-valve head. The Suzuki Gixxer and the Honda CB Hornet 160R make do with a 2-valve head. The Suzuki Gixxer produces 14.6bhp and 14Nm from a 155cc single-cylinder air-cooled motor. The Honda CB Hornet 160R, on the other hand, comes with a 162.71cc motor that makes 15bhp and 14.76Nm. Although the NS160 makes the maximum power from these three motorcycles, consider into your calculation their kerb weights and the equation changes altogether. The NS160 is the heaviest of the lot tipping the scale at 142kg while the CB Hornet 160R is just 2kg lighter at 140kg. While the Suzuki Gixxer is the least powerful of the lot, at 135kg it is also the lightest. All the three motorcycles come mated to a 5-speed transmission. All three motorcycles come fitted with telescopic forks up front and a monoshock setup at the back. Braking duties on the Pulsar NS160 are performed by a 240mm disc up front and a 130mm drum at the back. The Pulsar is the only motorcycle among the three to not get the option of a rear disc brake. The Gixxer comes equipped with a 266mm disc up ahead and a 130mm disc at the back. Meanwhile, the Hornet 160R has the largest front disc of all - 276mm and while the rear disc is the same size as the Gixxer. All three motorycles come with 17-inch wheels. In fact, the front tyres are the same size too - 100/80 - 17. The Pulsar NS160 has the narrowest rear tyre - 110/80. While the Gixxer comes fitted with a 140/60 rubber at the back, the Hornet 160R sits on 140/70 tyres. The CB Hornet 160R is the only motorcycle to also come with CBS. With a price tag of Rs 78,368, Bajaj has once again nailed it. That being said, the Pulsar NS160 doesn't get a few features that its rivals in discussion get. The Hornet 160R is the most expensive of the lot at Rs 86,313 for the CBS variant and Rs 81,863 for the standard trim. The Gixxer with the rear disc option is priced at Rs 81,013 while the non-disc variant costs Rs 77,936. All prices ex-showroom Delhi. Note: While the price of the Bajaj Pulsar NS160 is as per the new GST structure, expect marginal changes in the prices of the Suzuki Gixxer and the Honda CB Hornet 160R.